Summary of today’s show: Fr. Peter Loro, a priest of the new country of South Sudan, tells Scot of the extreme poverty of his country and the difficult conditions they have endured over the past 50 years. Yet he also considers himself blessed because of the astounding faith of the people. 1st segment: Scot introduced today’s topic of the Church in South Sudan. He said perhaps no group of Catholics has suffered more than the Catholics in the new Republic of South Sudan. The country gained its independence on July 9. Fr. Peter said the independence came as a result of a long struggle. It was a colony of Britain until 1956. Then the political and economic power was held by the Arab majority in the north of the country of Sudan. The south, which was mainly Christian and animist, was subjected to a lot of suffering. In 1947, the people of southern Sudan had been asked whether they wanted to be one country or to be separate. In 1955, the people of southern Sudan decided to choose to be free, but there were many difficulties. All the power, including the country’s resources, were held in the north. The north resisted the separation which brought civil war until 1972. Then there was 10 years of relative peace and in 1983, the president of the country abrogated the peace agreement and declared the country an Islamic country. Civil war began again. The fighting lasted for 22 years until another peace agreement in Nairobi, Kenya, in 2005. In that agreement, southern Sudan was again given the choose to split or remain as one country. Last January, the people voted overwhelmingly to separate. Fr. Peter said they were at war for 38 years out of the 55 years of independence since colonial times, because they refused to be second-class citizens in their own land. Scot asked Fr. Peter if religion was the primary reason for the fighting. Fr. Peter said in the south they are mainly Christian African versus the mainly Arabic Islamic north, but they were also treated poorly. Fr. Peter’s own family was separated by the war. Many of them had to run to Uganda when war broke out. Those left behind were separated as well. He fled to northern Sudan with his brother and the rest of his immediate family stayed behind. both of his brothers were killed in the war. Today, they are still re-grouping. Almost all families in southern Sudan were affected in one way or another. Fr. Peter said about 2 millions people died in the 22 years of Sudan since 1983. Most of them died as a result of direct fighting, but a number also died as the consequences of the war. Scot said South Sudan has a population of 8 to 9 million. Fr. Peter said the government of northern Sudan tried to say that there were only 5 million before the referendum on independence. Scot asked if many South Sudanese have returned since July 9. Fr. Peter said even before the referendum, millions of people were returning to South Sudan because they knew they were going to cast their own votes for freedom. Now the key towns and villages are overpopulated from all the refugees returning. Fr. Peter said he went to seminary at 14 years old and became a priest in December 1996. He has been a priest for 14 years and 7 months serving in very difficult situations. He has served in war and hates war. He says to his people now to live in peace. Scot asked him what it’s like to be a priest in his country. When Fr. Peter was ordained, he was assigned to a rural parish. He stayed for three weeks and then the parish priest traveled abroad and never returned. He had to assume the role of pastor. The people looked to the priest for everything: money, food, clothing, school tuition. But he had none of that because he came from a background as poor as they are. He stayed there for two years. He also had to travel miles throughout the parish to reach people, and didn’t have a car. The best he could do was ride a motorcycle. 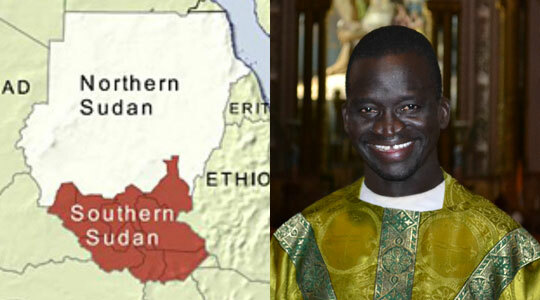 From there, he was sent to another parish in August 1999, even further from the city of Juba. There was no home for a priest to live. He was living in a military camp, traveling via canoe to villages and military camps along the Nile River. He did that for three years. When he left, he left behind a church and a school. Scot asked Fr. Peter to tell him about the hunger of the people of South Sudan. He said the people lived on less than 1 dollar per day, which can provide one meal per day. He said to have one meal in a day for these people would be a grace from God. And when he says a “meal”, it would not even be considered a meal in the United States. Most people cannot afford even that. People are forced to choose between food and shelter and education for their children. Many people choose the very basics just to survive. 2nd segment: Scot asked Fr. Peter about the Archdiocese of Juba. Juba is the capital of the new Republic. It has been there since the colonial years. The Archdiocese has 11 parishes at the moment and they’re setting up 7 more parishes. Fr. Peter said the largest parish is St. Mary Immaculate Parish. They have 103 chapels. It is the size of the state of Rhode Island. They have just two priests. The priests must travel miles and miles to reach the chapels over under developed roads. He said the Archdiocese is just too large. Fr. Peter said there are 54 active priests. There are also two bishops, Archbishop Paulino Lukudu Loro and Auxiliary Bishop Santo Loku Pio Doggale. Because of the great distances, the chapels have lay catechists who prepare the people for the visits by the priests. In a year, a chapel might see a priest six times. They have not just Mass, but the priest administers the sacraments and stays for a couple of days to see how the community is doing. Scot asked how the priests are supported. Fr. Peter said the priests’ families don’t have the resources to help them. The archdiocese is even poorer because it serves an even bigger family. The parishes ask for help from the priests instead of the other way. So the priests go on foot to the chapels because they don’t have the resources, even for buses. Scot said it sounds like the people are poor, the Church is poor, and the country is poor. The people often have to walk miles to celebrate Mass and even then only get to Mass a few times a year if they live in a rural area. Fr. Peter said the Mass is the consolation of the people. The priest brings the message of Christ and of love to them. when Fr. Peter went to villages for the first time, he would encounter 14 year old children who had never seen a priest and others who had never seen a black priest. The people move not only your sense of faith, but also show what humanity is all about. Sometimes the people had to overcome great obstacles as they travel to Mass. Some would even been killed by land mines or maimed. Some children are kidnapped on the journey, often on their way to their First Holy Communion. Yet they place an immense value on the practice of the faith. They are willing to risk their lives and limbs for the sake of receiving the Eucharist and the other sacraments. Scot said in the US we can take it for granted how it easy it is to get to church. He asked Fr. Peter what it’s like for him to share these stories with Americans, who can easily take their faith for granted. When he celebrated the first Mass at Fr. Roger Landry’s parish of St. Anthony, New Bedford. He was shocked at the big and beautiful church was so empty. If the church was in a village back home, it wouldn’t be big enough to contain all the people who would come for prayer. He sees in the US that the sense of faith is lost. Perhaps people have other “gods”. But in the Archdiocese of Juba, the truth of the Catholic faith and the sense of faith is so valued. Even though the people of South Sudan are so poor, they are in a better situation than most American Catholics because they know and love God so much. Scot asked how the people of America can help the priests. Fr. Peter said the Church in South Sudan is the home of the people because the Church brings education and medical care and the basic necessities. He said a single priest can make a big difference to many people, and if he doesn’t have even enough to support his own basic needs, then they can’t help the people. He said there is a need for the Catholics of the US to support the priests of South Sudan to provide spiritual and pastoral services to the people. If they cannot travel to the villages scattered throughout their parishes, they cannot bring Christ and the Gospel to the people. He recommends if people want to help financially that they can send contributions to Fr. Roger Landry at St. Anthony of Padua Parish, New Bedford, MA and he will ensure that the money will be sent to Fr. Peter. 3rd segment: Scot asked Fr. Peter how South Sudan is trying ti build itself as a new country. Fr. Peter said the infrastructure of the country was virtually destroyed during the civil war, civil, government, and Church. They are starting from nothing as a country and a church. Before the war, most of the villages had churches and schools built by missionaries, but the war destroyed them all. As a Church, they have a duty to rebuild the churches and schools. This requires money. Much more than that, they need to build the people. They don’t have a sense of culture, of peace, or of human rights. The people need to learn what it means to have peace and liberty and what it means to have rules that guide a people for a healthy and good life. They need doctors, mechanical engineers, and not just foreigners who will come, but their own people to be trained. They need qualified priests, who get further training and formation after seminary. He said the government has public schools, but they are not as effective as the Catholic schools. Scot said he has read that South Sudan has one of the highest percentages of infant mortality and of maternal mortality, dying during childbirth. Fr. Peter said in many of the villages, they don’t even midwives. Fr. Peter said there are plans to welcome foreigners who wish to come and help with their specialized skills, including doctors and others. Fr. Peter said the United States has been most helpful to South Sudan and has been the driving force that has resulted in the independence of South Sudan. He thanked the people of America for this. He said many American organizations are also working in South Sudan, including Catholic Relief Services. They have helped enormously in education, health, and building capacity. They have suffered with the Sudanese and even died with them. He is grateful in addition to the workers to the people who have donated to CRS from their own means. Fr. Peter himself is a beneficiary of CRS’ work because it funded his theological education. His bishop paid for him to go to the north for advanced theology studies and he was supported by this money from the bishop. And the money came from foreign donations, including some from Catholic Relief Services. Scot said when the second collection for Catholic Relief Services is taken up this year, he hopes the people of the Archdiocese of Boston will recall the voice of Fr. Peter and and the suffering of our Catholic brothers and sisters in other parts of the world. Fr. Peter asked the people of America to pray for the people of South Sudan. He asked them to pray for a meaningful peace and freedom and independence for South Sudan and that the people of South Sudan to know that they were not alone in their days of struggle, but that they received assistance from their American brothers and sisters. They should pray for a greater communion among people, so that they come to know Christ and see Christ in their neighbor. Fr. Peter will be in the US for another month and then he will go back to Rome for a time and then back to South Sudan. He hopes to become a parish priest, which will make him the happiest, to be with the people who need him.